The Hamburg based Hannes Rasmus released a record in 2013 called "Analog Ist Besser" on Gold Panda’s precious label Notown which also featured Luke Abbott from Border Community. 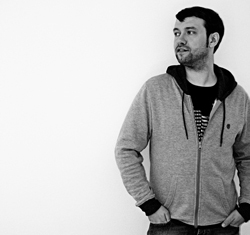 This put him on the map for minimal electronic melodic music with a lot of tastemakers and friends of melodic techno. Hannes Rasmus who can be described as a shy person who has developed a big knowledge for vintage synthesizers over the years. His challenge has been to write music with hardware, sequencer und synths. This may sound not so much of a challenge but for "people who know" the analog sound can bear as much beauty as it can be disastrous since it can be pretty much unpredictable and hard to handle as well. So we are talking here about a person who really loves and lives with analogue gear. Time led him through various forms/genres of electronic music making, going step by step towards minimal electronic techno and house music. Meanwhile his aim alongside writing music is to build his studio in Hamburg according to his personal demands, so this is as much of a process as doing music and will take time as he says. When he is not making music you can see him with a soldering iron building synthesizers with DIY kits or fixing old synths. 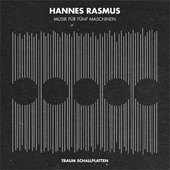 His EP on Traum "Musik Für Fünf Maschinen" refers to the equipment he used to write the music… the title of the tracks however refer to swimming pools. The opening track "Eine Leichte Brise Weht Über Das Sonnendeck" starts with of touch of early Detroit techno and in the course of it suddenly takes a big leap, a kind of an acceleration gaining a momentum of great zero gravity and effortlessness and you realize this is just the right amount of a different spirit to make it go down well in 2014. When another nice vintage synths kicks in, a nostalgic desire is expressed by a swaying sound doing all kinds of contortion but showing no clear direction... you know it is an awesome track. The track then lingers on in this mood until it slowly fades out like a piece of paper laying outside in the sun for days. So the title oft he track which translates „A breeze blows over the sun deck“ describes it in a tellingly way. A track that perfectly grasps and verbalizes a personal and philosophical feel. The b1 track "Die Rache Der Gummienten" plunges straightaway into a driving analogue sequence that is then joined by a contrasting one, which is a heavenly and romantic sounding melody Hannes played here. This is music with a view... like old seaside resorts still have that feeling in their paint. We feel less of a breeze here but more of a cloud formation marching along the horizon in double speed. Great! "Blicke Über Den Planschbeckenrand" is another great tune and in fact very different to other tracks. The track has a walking bass and stop & go motion. It likes to break down and regain its energy and motion build up before and so it creates a slick kind of waveform gesture all through he track. Or you may say it is a bit like a hand reaching out for a piece of soap that slips through your fingers. The track is equally euphoric as the other tracks but keeps the understatement making it a very charming and forceful tune. The digital add features a remix by Nick Dow. The Scottish producer has given a stunning debut on Traum with "The Insect Parade" and shows here why so many people were impressed by his debut. Nick has remixed "Die Rache Der Gummienten" working very much with the original sequences written by Hannes Rasmus but instead of turning vintage he has integrated his very emotional and pulsating glitch style to create a fascinating deep but driving version of the original. What his remix has in common with the original is that is has a superb flow... as if everything was happening by itself. The Egokind remix of "Die Rache Der Gummienten" is a wonderful fragmented, episode flavored remix with great a momentum in its details. Powered by a funky drumming it is not what you usually would expect from Traum but it is what we expect from Egokind, to be different, to go different ways. Vinyl A. / Digital 1. Vinyl B1. / Digital 2. Vinyl B2. / Digital 3.